WARNING: Inspect all seat belt assemblies including retractors and attaching hardware after any collision. The seat belt was in use at the time of a collision (except for minor collisions and the belts, retractors and buckles show no damage and continue to operate properly). The seat belt was damaged in an accident (i.e. torn webbing, bent retractor or guide, etc.). The seat belt attaching point is damaged in an accident. Inspect the seat belt attaching area for damage or distortion and repair if necessary before installing a new seat belt assembly. Anchor bolts are deformed or worn out. The seat belt pre-tensioner should be replaced even if the seat belts are not in use during the collision in which the air bags are deployed. Turn ignition switch ON. The seat belt warning lamp should illuminate. Fasten driver seat belt. The seat belt warning lamp should turn OFF. If the air bag warning lamp is blinking, perform self-diagnosis with CONSULT and air bag warning lamp. Refer to SRC-18, "Trouble Diagnosis with CONSULT". Check that the seat belt retractor, seat belt anchor and buckle bolts are tightened firmly. Check the shoulder seat belt guide and shoulder belt height adjuster for front seats. Check that guide swivels freely and that webbing lays flat and does not bind in guide. Check that height adjuster operates properly and holds securely. Fully extend the seat belt webbing and check for twists, tears or other damage. Allow the seat belt to retract. Check that webbing returns smoothly and completely into the retractor. If the seat belt does not return smoothly, wipe the inside of the loops with a clean paper cloth. Dirt build-up in the loops of the upper anchors can cause the seat belts to retract slowly. Fasten the seat belt. Check that seat belt returns smoothly and completely to the retractor. If the webbing does not return smoothly, the cause may be an accumulation of dust or dirt. Use the “SEAT BELT TAPE SET” and perform the following steps. Pull the seat belt out to a length of 500 mm (19.69 in) or more. Hold the seat belt at the center pillar webbing opening with a clip or other device. Pass a thin wire through the D-ring anchor webbing opening. Hold both ends of the wire and pull it tightly while moving it up and down several times along the webbing opening surface to remove dirt stuck there. Any dirt that cannot be removed with the wire can be removed by cleaning the opening with a clean cloth. Apply tape at the point where the webbing contacts the D-ring anchor webbing opening. NOTE: Apply the tape so that there is no slack or wrinkling. Remove the clip holding the seat belt and check that the webbing returns smoothly. Repeat steps above if necessary to check the other seat belts. NOTE: All seat belt retractors are Emergency Locking Retractors (ELR) type. In an emergency (sudden stop) the retractor will lock and prevent the webbing from extending any further. All 3-point type seat belt retractors except the driver seat belt also have an Automatic Locking Retractors (ALR) mode. The ALR mode (also called child restraint mode) is used when installing child seats. The ALR mode is activated when the seat belt is fully extended. When the webbing is then retracted partially, the ALR mode automatically locks the seat belt in a specific position so the webbing cannot be extended any further. To cancel the ALR mode, allow the seat belt to fully wind back into the retractor. Check the seat belt retractors with the following test(s) to determine if a retractor assembly is operating properly. Pull out the entire length of seat belt from retractor until a click is heard. Retract the webbing partially. A clicking noise should be heard as the webbing retracts, indicating that the retractor is in the Automatic Locking Retractors (ALR) mode. Grasp the seat belt and try to pull out the retractor. The webbing must lock and not extend any further. If it does not operate normally, replace the retractor assembly. Allow the entire length of the webbing to retract to cancel the automatic locking mode. WARNING: Perform the following test in a safe, open area clear of other vehicles and obstructions (for example, a large, empty parking lot). Road surface must be paved and dry. Do not perform the following test on wet or gravel roads or on public streets and highways. This could result in an accident and serious personal injury. The driver and passenger must be prepared to brace themselves in the event that the retractor does not lock. Proceed to the designated safe area. Drive the vehicle at approximately 16 km/h (10 mph). Notify any passengers of a pending sudden stop and the driver and passenger must be prepared to brace themselves in the event that the retractor does not lock. Apply brakes firmly and make a very hard stop. During stopping, seat belts should lock and not be extended. 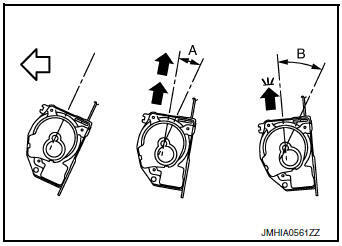 If the seat belt retractor assembly does not lock, perform the retractor off-vehicle check. Remove the front seat belt retractor. Refer to SB-8, "SEAT BELT RETRACTOR : Removal and Installation". Slowly pull out webbing while tilting the seat belt retractor forward from the mounted position without twisting the seat belt retractor as shown. The webbing can be pulled out if the retractor is tilted 12° degree or less. The webbing can not be pulled out if the retractor is tilted 27° degrees or more. NOTE: A and B show tilting angles. Replace the seat belt retractor if it does not operate within specifications. Remove the seat belt retractor. 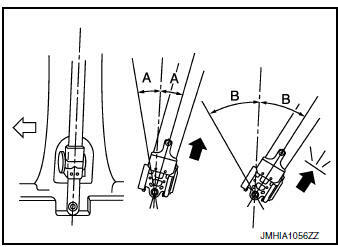 Refer to SB-12, "SEAT BELT RETRACTOR : Removal and Installation". Remove the seat belt retractor. Refer to SB-17, "SEAT BELT RETRACTOR : Removal and Installation".